If you graduated from Wake Forest between 1940 and 2000, you probably knew, or at least knew of, Robert Helm (’39). Odds are good that you, or a friend, had Helm for “Meaning and Value,” “Space and Time” or some other equally challenging philosophy course. It was what I didn’t know about the retired philosophy professor that left me surprised and impressed Homecoming weekend. 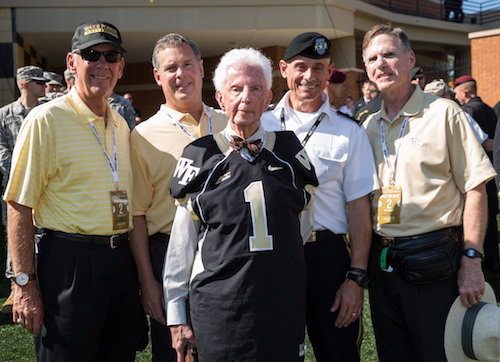 If you were at the Wake Forest-Army game Saturday, it had to warm your heart to see Helm – 97 years old and looking spiffy in a bow tie and Wake Forest #1 jersey – hitch a ride with the Demon Deacon to “open the gate” at BB&T Field. 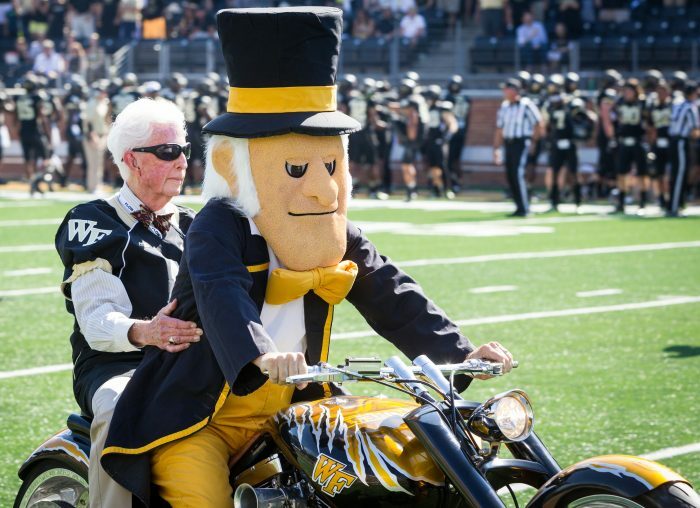 Helm’s service to Wake Forest is unparalleled. He joined the faculty shortly after graduating, left for a few years to serve in World War II and then rejoined the faculty to teach until 2002. He was named to a distinguished professorship in 1983 when he was appointed Worrell Professor of Philosophy. But he was honored, appropriately, at the Army game for what I suspect many at BB&T Field didn’t know about him until they heard the P.A. announcer describe his service to his country and school. Lieutenant Colonel Helm served in World War II in France, Luxemburg and Germany. He was with the 89th Infantry Division in General George Patton’s Third Army as it fought its way across Europe. When he returned to Wake Forest in 1947, he persuaded then-President Harold W. Tribble to pursue an ROTC program on campus. According to Bynum Shaw’s “History of Wake Forest College,” about 300 colleges and universities submitted applications to the Department of Defense to start ROTC programs on their campuses; 32 were selected, including Wake Forest. The Wake Forest ROTC unit had offices and classrooms in the basement of Binkley Chapel on the Old Campus; drills were held on the athletic playing fields. Helm served for years as faculty coordinator and chairman of the ROTC committee while continuing to serve in the Army Reserve. Since 1951, nearly 2,000 Wake Forest graduates have been commissioned as Army second lieutenants. If you’ve ever been to Commencement, you know that the commissioning ceremony is one of the highlights of the day. An impressive trio of officers who got their start through the Wake Forest ROTC program was on hand to honor Helm at BB&T Field. Major General (Ret.) Richard Beale (’64), Major General (Ret.) Charles McCartney (’69) and Major General (Ret.) 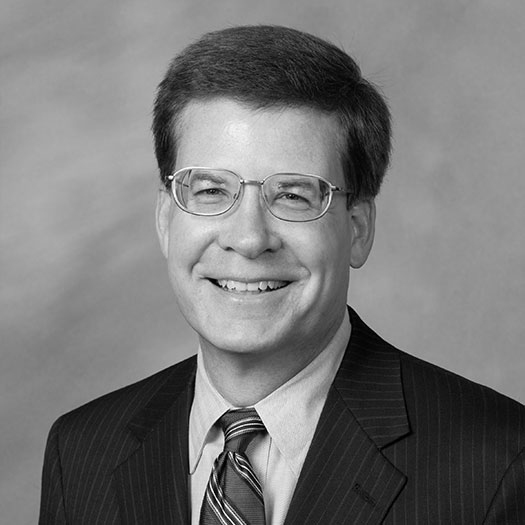 John Yingling (’74). They are the only Wake Forest Army ROTC graduates to be promoted to the rank of Major General. They were joined by Lieutenant General Robert Caslen, superintendent of the United States Military Academy. Honoring Robert Helm at BB&T Field were (left to right) Charles McCartney, John Yingling, Robert Caslen and Richard Beale. “He’s a patriot. He was part of that generation that Tom Brokaw refers to as ‘the greatest generation.’ He understood the importance of serving your country when the time came,” said Beale, who retired in 1996. And that’s why Robert Helm was chosen to open the gate.